What’s the Event Center’s seating capacity? 270 people with dance floor. 20 8′ x 10′ trade show booths. 15 10′ x 10′ trade show booths. Is it possible to rent just part of a day? Yes, we offer partial day rentals for events that just need a few hours, and for events that don’t need all the features the center has to offer. See our Rates page for details. Following the event, Renter is responsible for removing all decorations, personal items and equipment, and putting trash in the receptacles provided. Renter will clean catering area, prep tables, and refrigerator/freezer. Can I download your rental agreement? You can download our Rental Agreement HERE. Does the center have a stage for performances or weddings? 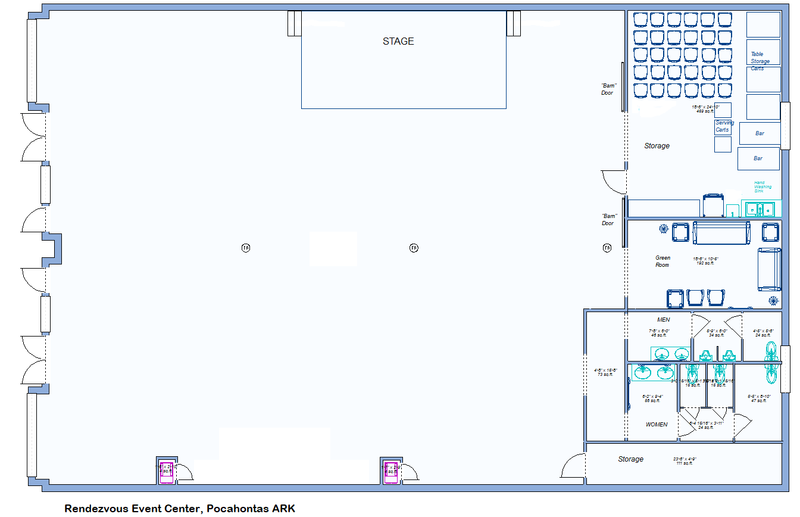 Yes, the stage is 25′ wide x 12′ deep, raised 18″ above floor level. Does the center have a projector and sound system? Yes, there’s a ceiling-mounted projector to which you can connect your computer, and a good PA/sound system with 6 wireless and 1 wired hand/stand mikes with stands, and 2 wireless lapel mikes. The system will play audio output from any device with a standard 3.5 mm audio output jack, like a mobile phone or laptop computer or tablet. You can also bring MP3 music installed on a USB flash drive and the system will play it. What sort of stage lighting do you have? We have 2 four-light ceiling-mounted Chauvet CH-460LS lighting systems with foot controllers. There are also white LED flood lights for general stage lighting. Yes, we offer free high speed wi-fi. Does the Center have a kitchen? No, you can’t cook or re-heat food at the Event Center. You’ll need to bring your food ready to eat, or hire a caterer. We do have a spacious room suitable for plating and serving food, and there’s a microwave oven. We have six 30″ x 96″ rectangular serving tables and two standard-sized refrigerators you’re welcome to use. How much parking does the Event Center have? There are over 500 free parking spaces within 3 blocks of the event center, using both city parking lots and on-street parking. How close is the Event Center to the Old Randolph County Courthouse wedding venue? The Event Center is 1 block, about 200 feet, from the front door of the Old Courthouse. Of course, we can also host weddings inside the Event Center. Can you recommend a local florist? 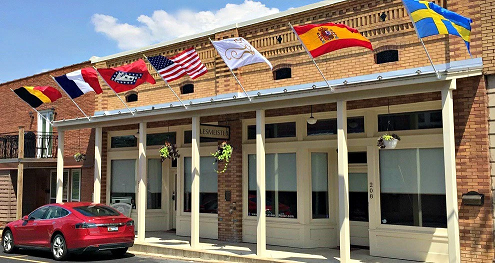 We recommend Bloomingtown Florist & Gifts, 2479 Thomasville Ave., Pocahontas. Is there a charge if I have to cancel my event? And what about liability issues? When you reserve the event center, we turn down other people who want to rent the center, to hold that date for you. So yes, depending on how close we are to the event date, you may lose some or even all of the event cost if you cancel. We suggest you consider taking out special event insurance to reimburse you for these costs, should cancellation be necessary. Several online companies offer reasonably-priced special event insurance to cover your event for liability, damage to the event center, and cancellation. One very good one is EventHelper. For weddings exclusively, WedSafe is also a good option. Is the Event Center handicapped accessible? Yes. The Event Center is all at city sidewalk level, and the city sidewalk has a shallow ramp from street level, at the corner of Everett Street and Marr Street, by Bella Piazza Italian Restaurant. The bathrooms have wheelchair-sized stalls available, and grab bars. We need room for multiple events going at the same time. Are there other conference/meeting places nearby? Yes, downtown Pocahontas has 11,000 sq. ft. of meeting space. For a full description of what is available, see HERE.